what does Lisa say about it? : Why are restaurants so sketchy? For my first post I will share with you some odd restaurant experiences I had today. That's right. I ate at two restaurants in one day. Pretty hoity toity of me, huh? 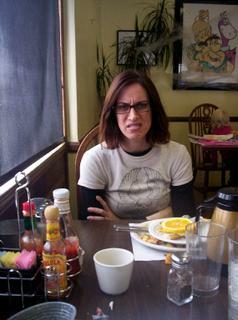 My first dining experience took place at a favorite breakfast place of mine in the San Fernando Valley. I'll refrain from using the name of the restauant so that I may eat there again, but let's call it Pinky's. I've eaten at Pinky's for about 14 years now, long before it expanded the first time, and even longer before its second expansion. I felt special finding this place before everyone else. I felt special eating pancakes I knew very few people had tasted. I felt special getting a whole pot of coffee on my table. People there knew my name. It's different now. It's a popular place. The wait on the weekends is an hour or so. I no longer go there on the weekends. But, today being a Tuesday, I decided to have a late breakfast with my friend Max, whose very fault it is that I'm doing this blog in the first place. Max and I got to Pinky's at around 12:00. It was busy as usual but we were seated quickly. Our waitress seemed a bit frazzled, but it was the lunch rush so we let it go. Max and I waited tables for many years, you see. We let a lot go. My coffee came and so did Max's iced tea, but the iced tea seemed very small and was sans lemon, and my coffee cup had a lipstick stain on it. A big, obvious lipstick stain. Now, as I've said, I was a waitress for many years. 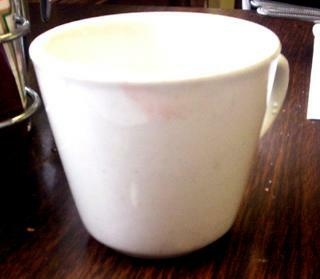 Rule number one: CHECK THE CUP FOR LIPSTICK. 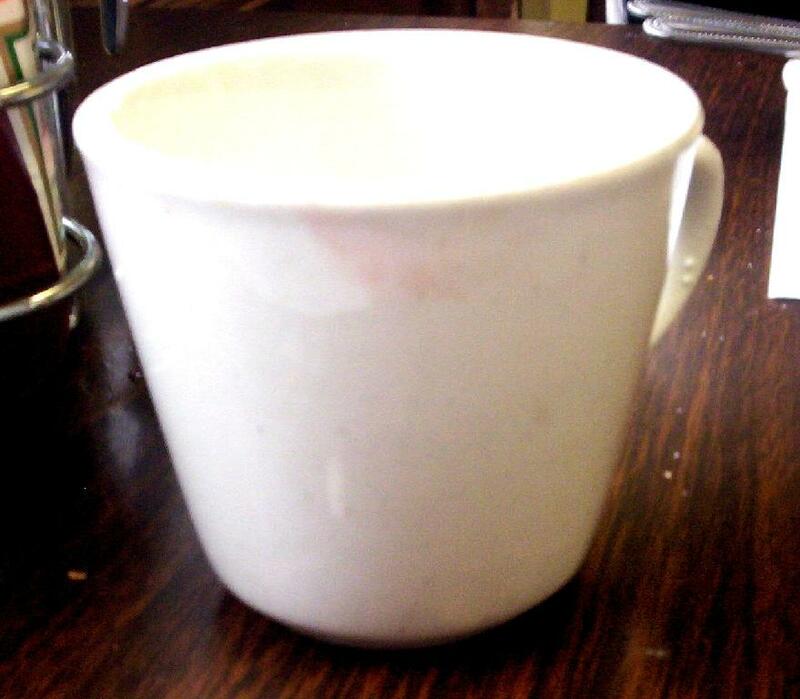 IF THERE IS LIPSTICK, WIPE IT OFF OR GET A CLEAN CUP! As I complained about the cup, to no apology by the way, Max asked for a lemon to freshen up his pathetic iced tea. I begrudgingly got a clean cup. He got a lemon and a bigger iced tea, also begrudgingly. 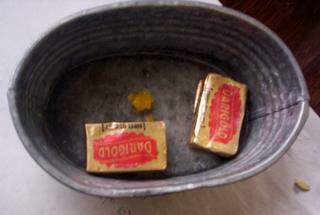 Then I noticed some disgusting yellowish blob of something in the tub with the pats of butter. For some reason, maybe because I had no idea what it was, it made me nauseous. I had to turn the tub over just to get rid of it. Then I went to put sugar in my coffee but the sugar had somehow gotten wet and was all clumpy and not coming out of its container. I switched it with the sugar off another table. This was not going well. When the food came it was tasty and everything went fairly smoothly from there. But, I'd be lying if I said my Pinky's experience wasn't a bit tainted. It's not like it used to be there. I mean, the tables used to be clean and so did the cups. I used to feel special there. The service used to be as good as the food. Now they're both just okay. I miss the old days. So we were just eating at our favorite Indian place. I'll refrain from using the name to protect the innocent. It's the best Indian food in the valley, and I frankly think it's the best in Los Angeles. Now, every time we go there something weird happens. Most of the time, it's just supremely bad service. But the food is always so amazing, we have to keep going back. We went in June for my husband Russ' birthday and there was only one other couple in the whole place. They sat us at a small two-top when clearly there were several four-tops available. We asked for a bigger table, citing the fact that we would order so much food that it wouldn't all fit on one table. They said they were sorry, the four tops were reserved for 3 or more people, but they could bring a cart next to the table if we needed it. Suffice it to say, the bigger tables were all still available when we left that night. We went again about a month ago. It took 45 minutes to get our food, but people coming in and ordering food to go were getting their food in 10 minutes. We ordered re-fills on our diet cokes and were told by a sheepish busboy, "I'm not supposed to do this. They charge for refills. but i'll do it this one time." Again, the food was great, but the service severely lacking. An apology for the long wait came at the end of the meal in the form of an odd but delicious liquor covered donut-type dessert. The waiter said, "We're sorry you waited so long. We realized you never complained." Huh? "Don't leave a big tip. It goes to the owner, not to the waiter." "Don't leave a lot of money. Just five dollars or something. The owner takes it all." Um, he couldn't have said that. That's completely crazy. Are these people treated like slaves? Is that why the service is always so bad? We beckoned him over again. Could you repeat that one more time? "The lady is the owner. She takes the tips. Please don't say anything." On our way out, I told him we'd bring cash to tip him next time. He said he'd appreciate it. Damn it, Our Favorite Indian Restaurant! Can't you just get it together? Thus ends my first blog. I hope you weren't bored to tears. If you were, you can send it back and I'll get you something else. My new favorite blog. And lemme be the first to say that this blog is EXACTLY what I need right now in my stupid life. You'd BETTER damn well stay on top of it, Lisa Arch, if you know what's good for you! Hey there, thanks for sending the link and update. Looking forward to checking in every once and a while :-). THE OWNER KEEPS THE TIPS!!!!!!!!!!? But I am very impressed with your memory and spelling of the Indian food dishes.